To make marinade, mix wholegrain mustard, mint jelly and reduced salt soy sauce together together in a small bowl. Microwave for 40 seconds to combine. With a pastry brush, coat meat and vegetables with marinade. 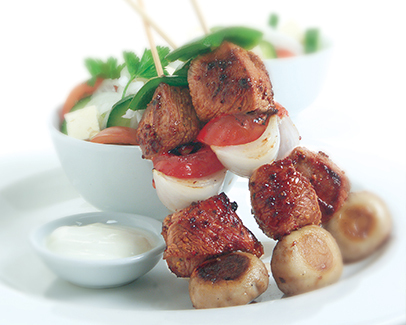 Cook kebabs for 5-10 minutes, turning frequently and brushing regularly with marinade. HINT: soak bamboo skewers in hot water for a few minutes to prevent splintering or burning on Barbecue.